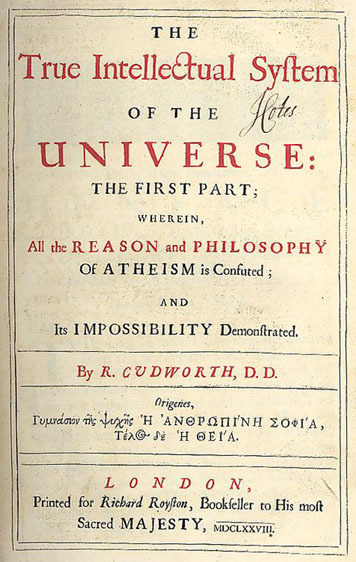 I noted in an earlier post that the historian of philosophy Johann Jacob Brucker, writing in the 1730s and 1740s, distinguishes More’s ‘Platonico-Cabbalism’ from Cudworth, Gale, and Burnet’s ‘Alexandrian’ form of Platonism in his characterisation of their position. This must certainly reflect the fact that More had gained an early reputation in continental Europe for his engagement with the Cabbala. It is noteworthy that one of the first publications of note addressing More’s work on the continent, the Herborn Lutheran professor Samuel Andreae’s Examen Generale Cabbalae Philosophicae D. Henrici More (Herborn, 1670) is a critique of More’s Conjectura Cabbalistica (London, 1653), with which he was familiar in the English. More responded to Andreae’s critique in the scholia to his Opera Omnia (London, 1679), which in turn attracted a response from Andreae (then at Marburg) in his Epistola apologetica, ad virum eruditissimum & celeberrimum Henricum Morum (Marburg, 1684). Johannes Franciscus Buddeus, in a 23 page section of his Introductio ad historiam philosophiae Ebraeorum (Halle, 1702) discusses More’s Conjectura Cabbalistica before passing to a consideration of his later Cabbalistic writings. For full text of this post see here.